1) Turn your car cooler fan and put it on high speed. Set the fan to use the air outside the car. (If your car's air conditioner has an air filter, remove it as well). 2) In order to wash the seams successfully, put the red pipe, along with the can of MARPA Air-conditioner Cleaner Spray, on the pump head of its sprayer and use the cleaner. 3) About 2 minutes after the time you run the air conditioner, shake the can of MARPA Air-conditioner Cleaner and spray it into air inlet of the air conditioner. It is also necessary to shake the can periodically while spraying. 4) To spray MARPA Air-conditioner Cleaner materials easier, try to hold the can vertically. Do not tilt it more than 45 degrees relative to an imaginary horizontal line. Try to keep the spray head upward. 5) Turn the car cooler off for 3-5 minutes. 6) While you turn on the air conditioner again, the car ventilator will drain the dirt of the cooling system, along with water wasted from its outlet pipe. 7) MARPA Air-conditioner antibacterial Cleaner Spray destroys the odor in the cooler and prevents the bacteria to grow for a period of time. 8) MARPA Air-conditioner Antibacterial Cleaner Spray helps preventing the car cooling system freeze or boil. It helps less energy consumption and is effective to extend the life of the car cooling system. 1) First remove the panel of your air conditioner, and take out its filters. 2) Shake the can of MARPA Antibacterial Air-conditioner Cleaner and spray it on the condenser of the air conditioner densely. To spray MARPA Air-conditioner Cleaner materials easier, try to hold the can vertically. Do not tilt it more than 45 degrees relative to an imaginary horizontal line. Try to keep the spray head upward. 4) Then, turn your home ventilation system on, and put it on high speed. 5) To remove the sediment contamination, you can spray more MARPA Air-conditioner Cleaner while the air conditioner is running. 6) Replace the filter screen and the panel. 7) The dirt is discharged automatically from the drain outlet. Avoid employing MARPA Air-conditioner Cleaner Spray directly on surfaces that are in contact with food and drink! This spray contains pressurized flammable material; keep it in a cool and dry place (with a temperature lower than 45 ° C), with adequate ventilation, away from heat, flame, and direct sun light! 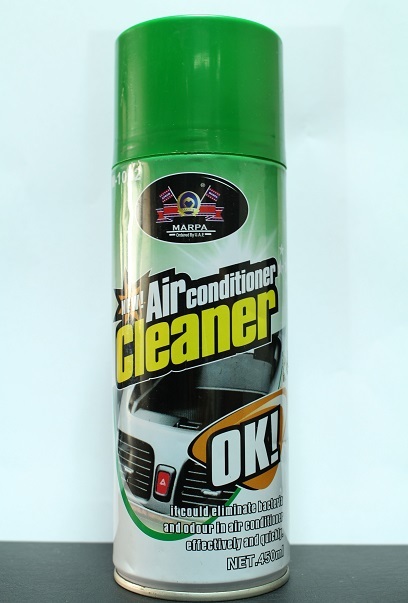 Do not put the can of MARPA Air-conditioner Cleaner Spray near the front or back windshields; and keep it away from hot air outlet of the car! MARPA Air-conditioner Cleaner Spray tin can is recycled after it is completely used up. Do not puncture, bend or incinerate the container of MARPA Air-conditioner Cleaner Spray, even after it is fully used! For eye contact, flush with clean water and consult a physician! If swallowed, immediately induce vomiting and call a physician! If skin contact made, wash with soap and water. If irritation develops or persists, consult a physician! Keep MARPA Air-conditioner Cleaner Spray out of reach of children and animals!